The ultimate guide to Ellmau ski holidays in 2019 & 2020. This achingly traditional Austrian village looks out to rolling hills, thick forests and those gorgeously rugged Wilder Kaiser peaks. It’s also part of the country’s biggest ski area and, if that wasn’t enough to shout from the rooftops, the transfer time’s less than an hour. Set at the foot of the Wilder Kaiser Mountain range, Ellmau has a small population and so much classic Austrian charm that you’re unlikely to get through the week without donning Lederhosen or a dirndl... The village is built of the sturdy wood and stone structures you only find in the mountains, made picture-perfect by the central parish church. It’s not all about the aesthetics - you’ll find some excellent eateries, affordable après ski, and good quality chalets, hotels and apartments of all shapes, sizes and star-ratings. So far, so good, but here come the real perks: being within an hour’s drive from the Innsbruck, Munich and Salzburg airports, this is one of the most easily accessible resorts in the Alps – especially convenient for quick ski breaks and family trips. The village is easily reached by road and an uber-efficient shuttle bus service runs within the resort to keep the roads as clear and traffic-free as possible. Then there’s the skiing – with a respectable top altitude of 1870m and terrific snowmaking technology, the slopes behind the village are always well prepared for a day on the snow. 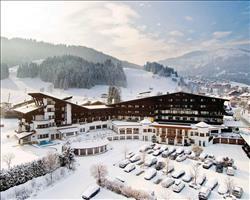 This resort is one of the focal points of the SkiWelt Wilder Kaiser-Brixental - the largest interconnected ski area in Austria at 280km (including Scheffau, Going, Söll, Westendorf and Hopfgarten). For even more coverage, serious skiers can purchase the Kitzbuheler Alpen All Star pass for access to over 1000km of piste in no less than 10 ski areas (including the resorts of Kitzbuhel, Alpbach, Kaprun and Saalbach). View our detailed Ellmau snow forecast or snow report and see all live webcams, piste maps, road and travel maps and lift pass prices. For a picture of historic snow conditions see the snow depths month by month with our Ellmau snow history. Nearby resorts: Ski Welt, Hopfgarten, Itter, Scheffau, Söll, Westendorf, Brixen im Thale and Going. The resort has an excellent lift system connecting to the neighbouring villages of Going and Scheffau. It really comes into its own for beginners: children’s lessons take place in ‘Kinderland’ (next to the ski school office on Alte Straße 3) which is kitted out with magic carpets, snow plough area and mini slaloms. You’ll find a range of short, gentle blues at the bottom of the mountain leading down into Ellmau and Going, well protected and separate from the rest of the ski area. #100b from Astberg is a nice long route to progress onto, as is the #80 from Hartkaiser on the other side of the village. Intermediates will be in their element - jump on the Ranhart draglift and head to the Hartkaiser #80a to see what you’re made of, then move on to wherever takes your fancy. Whilst this resort may not be renowned for its white knuckle terrain, the sheer variety keeps things interesting for those who are happy to roam. There may not be heaps of off piste, but you’ll find some decent trails on Hohe Salve - with the area’s main draw being for beginners, the powder remains widely untouched. In terms of terrain parks, the local Kaiserpark probably best serves families but confident freestylers can head over to Söll and Westendorf for more of a challenge. After hours, one of the local runs from Astberg is usually illuminated or you can pop over to Söll which has a massive 10km of floodlit pistes – Tyrol’s biggest night skiing area. The local après is low key but merry -with Pub 66 easily winning the gong for most popular drink spot (trust us, after a few sherries the karaoke here starts looking a lot more appealing..!). Living up to Austria’s reputation for stein-swinging après, Ötzi is a fantastic nightclub where you’ll find live music, DJ’s and enough drink to keep the whole of Ellmau happy. If you’re in the mood to warm up and relax, we love the Bettina - a gorgeous mountainside café in the perfect location for a family pit stop on the way back down the slopes - they do smashing hot chocolates and gluggable glühwein. Amongst the thirty-something restaurants, Brenneralm is a favourite for its varied menu (including all the best hearty Austrian dishes), convivial atmosphere and stonkingly good views (best enjoyed from their sheepskin covered deckchairs) – on top of the fact that it’s right on a toboggan run, which sprogs always love. Italian restaurant and bar, Memory, is the place for pizzas and cocktails that won’t break the bank and Saffron serves an intriguing, totally delicious mix of Indian, Italian and oriental for some of the best prices we‘ve seen. Non-skiers won’t have to sit twiddling their thumbs here, with attractions off the piste including a swimming centre with a sauna and steam bath and a sports complex with tennis and squash. There’s also traditional winter fun aplenty with sleigh rides, curling and ice skating. When is the best time to ski Ellmau? In the northern part of the SkiWelt, Ellmau’s slopes have some of the best snow in the area. They’re not Austria’s highest, so for good coverage it’s best to ski here in the middle of the season (January-March) when the snowfall’s most consistent and weather’s coldest. The pistes face all directions and being part of a huge and varied ski area, you can plan your skiing to find the best snow throughout the season. If snowfall’s lacking, the area has excellent snow making coverage thanks to a socking great 1700 snow cannons all over the region. Christmas in Ellmau has an especially magical feel and a ski holiday here will leave you with a memorable Christmas week. The skiing at this time of year is great and there are lots of festive activates to take part in! 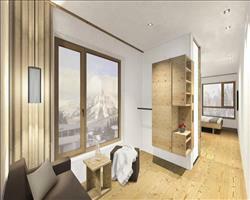 Ellmau is a beautiful family resort with great facilities and an atmosphere to match. This is a resort families fall in love with and want to return again and again. Choosing the right accommodation for your family holiday is important and there are some terrific options in Ellmau. If you want to have a traditional ski experience, stay in one of our chalets like Chalet Hartkaiser where you have the benefit of chalet hosting allowing everyone to put their feet up and enjoy quality family time. If you fancy a hotel then there are plenty of fantastic options. 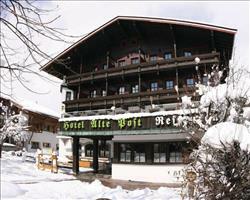 Try out Hotel Hochfilzer which is near the ski school and nursery slopes. With meals included and on-site facilities, you can all enjoy a relaxing holiday. A lot of hotels have childcare on site which can be really handy for families with young children. Self-catered holidays are also available with accommodation like the Fuchs Apartments. Only an hour’s transfer from Innsbruck, Munich and Salzburg airports, it’s really well suited to families travelling with small children. There are a range of childcare options in resort and accommodation for children too young to ski and for those old enough to hit the slopes, the ski schools are second to none - Schischule Ellmau Hartkaiser and Top Ski School Aktiv Ellmau have patient ski instructors that will teach you and your kids to ski in no time! Superb nursery slopes are located a short walk from the centre of the village, they’re wide open and a safe distance making them the perfect place for the kids to learn! For family time on the snow, you’ll find some lovely runs or if freestyling is more your families’ style then there’s a snowpark with fun obstacles that’s especially popular with teenagers. For a break from skiing there are numerous non-ski activities to take part in – you’ll find a fantastic indoor swimming pool and centre with thrilling slides and a sauna and steam bath for the adults. You can also have a go at ice skating, ice curling and sledging. There are plenty of eateries in the area most of which are family friendly. Cantina Bar Mexican is a really popular with families visiting the resort as they offer fantastic kids options. 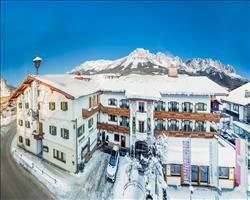 There’s some amazing accommodation in the area to suit groups of all shapes and sizes holidaying in Ellmau. This includes beautiful chalet options for a fantastic group ski holiday - check out Chalet Enzian if you’re travelling as a party of 10 and after somewhere you can have to yourselves. Hotels are another popular option for groups and there is plenty of choice in Ellmau - have a look at Hotel Hochfilzer, it’s in a great central location near slopes and shops and has fantastic facilities. For a cheap group holiday, self-catered apartments like Fuchs Apartments are fantastic – everyone can take turns in the cooking and cleaning and enjoy quality time in an intimate setting. With excellent ski schools, slopes to suit every preference and fantastic connections to the Ski Welt, the slopes here are perfect for groups of mixed abilities. As well as great skiing there are some excellent bars for après ski and a fun night club where you can all dance the night away. Pub 66 is a favourite après venue with tourists and locals - it holds karaoke nights that are nearly always rammed with partying snow lovers. There are over thirty restaurants in the village that will really suit everyone’s taste. Head down to Saffron for some of the most delicious Indian food you’ve ever tried! If some of your group would rather spend their holiday away from the slopes, there’s plenty to do. Winter sport activities include ice skating, curling and sledging and you can also have a game of skittles with the locals! 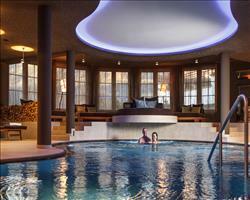 One of the most popular non-ski attractions is the large swimming pool centre with slides, saunas and steam baths. First ski holiday in Ellmau, there wasn’t a lot of snow but they had lots of the artificial stuff and as ski areas go, it’s a good one with runs for all levels. The village is quiet but we didn’t go for the après, if I’d wanted to party I’d be better off somewhere else. As a whole, all good, I’d happily come back here. "Good for beginners & families"
Ellmau is better suited to beginner – intermediate skiers. I’m more of an advanced skier but it was fine because I was teaching someone to ski. The ski area is not the same as big resorts like Les Deux Alpes in France. I prefer large ski areas. It’s a nice little resort though, really good value and great for families. I wouldn’t really come here as a big group or as a couple. The whole town is quite quiet.